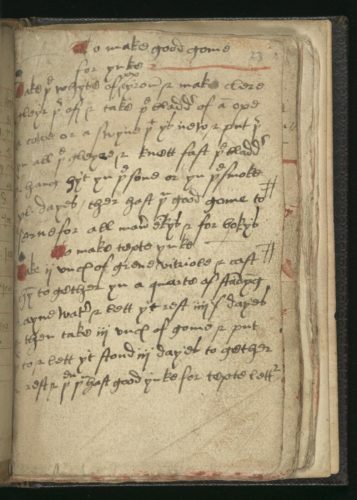 An early sixteenth-century recipe for “good gome” in Wellcome Library MS 406, f. 23r. Digitized images of the manuscript available at https://wellcomelibrary.org/item/b18935709. One of the many pleasures of studying late medieval English “how-to” manuscripts is the wide and often surprising array of knowledge to be found within them. Most contain a good bit of medical information, such as herbal recipes and instructions for bloodletting, and many also contain useful household information, like directives for animal husbandry, fishing, hunting, sewing, ink-making, and so on. Also common to these collections are charms for curing fevers, staunching blood, and protecting women in childbirth. Some medieval English collections of recipes also contain magic of a lighter sort, like directions to “make a woman lift her skirts” or “to make thunder and lightning,” discussed in earlier posts by Laura Mitchell and Catherine Rider. One such example of a light—and somewhat lascivious—recipe is found on folio 20 of Bodleian Library MS Ashmole 1389, a late fifteenth-century recipe collection compiled by William Aderston, probably a surgeon working in London. Take grain with evil thistles [thystylls] which grow above the ditch & make from that a powder & put it in someone’s lap & immediately he or she will take off his or her clothes. 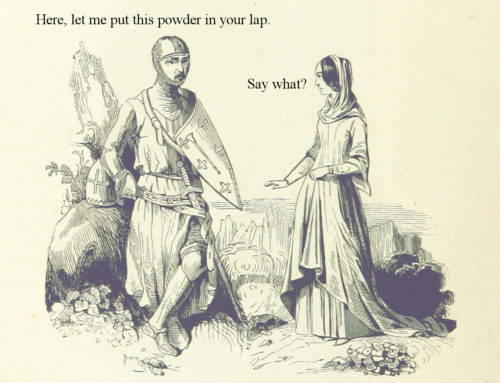 Image credit: British Library, from Prudence Guilllaume de Roujoux, Histoire d’Angleterre (Paris, 1844), text added by Melissa Reynolds. Certainly, as Mitchell has suggested, recipes like this one “to make men and women take off their clothes” are inherently playful. Yet I am also inclined to agree with Rider who points out that there is little evidence that medieval compilers drew a sharp distinction between lighthearted recipes and straightforwardly practical ones. In the case of Ashmole 1389, the recipe to make men and women shed their clothes appears within a short section of non-medical recipes in an otherwise overwhelmingly medical collection. Most other non-medical entries in the manuscript are clearly useful, like a recipe to make glue or instructions for fishing and engraving on metal. So why was this recipe included in an otherwise useful collection, and what can its inclusion teach us about late medieval culture? Historians can read 500 year-old recipes for medicine, agriculture, textile production, or cooking and understand why such knowledge was selected for “how-to” manuscript collections, even though the materials and techniques described are unfamiliar to us now. We can understand why so many collections feature useful, natural magic, as there was little distinction between magical and non-magical cures in medieval culture. In these cases, our understanding of the medieval recipe book rests on the basic premise that people wanted acces to useful (and useable) knowledge. But recipes like this one “to make men and women take off their clothes” are perhaps more illuminating precisely because they don’t fit this mold. They challenge our presumptions about the purpose and function of a recipe. This recipe isn’t obviously practical, nor is it even apparent that it could be, or ever was, attempted by its compiler. Though lighthearted magic like that in Ashmole 1389 is not nearly as common as healing magic, its presence in medieval collections should encourage us to reflect on what we expect from a recipe, and how those expectations color our historical interpretation. Perhaps we should ask ourselves if our focus on finding out how pre-modern recipes “work” always reflects the focus of pre-modern compilers and readers? Attempts at recipe reproduction can yield unmatched insights into pre-modern worldviews, materials, and techniques; hands-on and collaborative research into recipes should by all means continue! But while we’re building furnaces, making chacolet, and casting flowers, let us also remember that a pre-modern recipe might have had any number of meanings or uses for the pre-modern reader, some of which we may not yet fully understand. Aderston left his signature at the bottom of a recipe on folio 14v (“per me W. Aderston”) and a record at the National Archives of the UK contains reference to a “William Aderston, of London, surgeon” as plaintiff in a trespassing case against the sheriffs of London sometime between 1483–1515. Ad faciendum homines & mulieres deponere pannos suos / Accipe grana malignos cardenibus ^thys tylls^ qui crescunt super fossat & fac inde pulvere & ponite in gremio alicuius & statim exuet pannos. The Latin gremio could be “lap, bosom” or “womb; female genital parts.” You can see how a different translation would change the sense of the recipe entirely. Heat is transformative, brings about change, separates substances or bring them together. Every student of chemistry knows how to enable or enhance a chemical reaction by applying energy to a system, usually in the form of heat. Early modern practitioners did not think otherwise. Fire was the transformative element and key to the production of all kinds of different materials, ranging from the philosopher’s stone to artisanal products such as glass, porcelain or pigments. Applying heat to bring about change is publicly ingrained thermodynamics, but one thing is even more obvious. Once heated, things have to cool down again. Figure 1: Eikelenberg’s notes on the art of painting, comprising five different manuscripts. Photograph: Regionaal Archief Alkmaar. When the request came to write a blogpost on cold and recipes, I was somewhat hesitant. Heat seems to elicit the most interesting stories and anecdotes, but interesting cases with respect to cold failed to come to mind immediately. Hence, I tried a different approach and looked at how cold featured in a collection of overtly practical notes on the preparation of paint materials collected by the Dutch polymath and painter Simon Eikelenberg (1663-1738). Intended for publication, he promised his readers an “accurate descriptions of the origin of making, preparation and general use of paint materials, oils, mix-fluids and varnishes.” It was within the confines of this manuscript that I began to discern two themes with respect to cold in practices of making. Figure 2: Reconstruction of one of Eikelenberg’s varnish recipes. The varnish was prepared in a glazed pot, placed in a sand bath and heated on fire. Photograph: Thijs Hagendijk. It is only when things have cooled down that the transformative work of heat can really be judged. 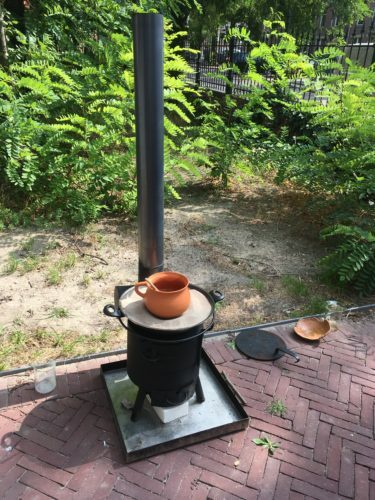 Eikelenberg describes for instance how he experimented with minium, a red lead-based pigment, which he heated in a crucible and placed in a fire. 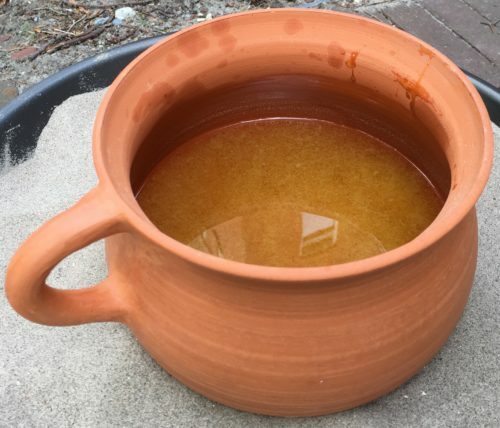 “The more it glowed, the more the minium turned yellow near the sides of the crucible, the lowest parts alike; which, when it was cold, appeared to be nothing else but yellow massicot.”  Eikelenberg also describes the preparation of various varnishes. Here too, quality and properties of substances are explicitly observed after the varnishes have cooled down. “When the varnish was cold I found that it was rather thin and that it did not cover well.”  Another varnish was prepared on a hot sand bath, after which Eikelenberg “filtered it through a cloth and let it cool: it appeared then as a thickish and yellowish varnish.”  Pay attention to the word “then”: there is a clear order of things that speaks through Eikelenberg’s notes. Being cold is a condition that precedes testing and Eikelenberg makes that rather explicit. Figure 3: It is hard to achieve a homogeneous mixture when preparing varnishes. A whitish sediment is developing in this varnish, which is in coherence with Eikelenberg’s notes. Photograph: Thijs Hagendijk. Whereas heat is transformative, it is only in the absence of heat that things can be trusted to stay the same. Continuing with the varnishes, Eikelenberg was well aware that their preparation does not stop after the ingredients have been heated and combined. As long as it is still hot, the apparently homogeneous concoction can easily coagulate and fall apart. Eikelenberg wrote in his notes: “We can conclude that to prevent curdling it is necessary not to stop stirring before the mixture is cold.”  Indeed, each time he made varnishes, Eikelenberg made sure to keep stirring until everything was cooled down: “stirring steadily until all was cold” or “having stirred until it became cold”. Figure 4: Eikelenberg mentions that: “[w]e can conclude that to prevent curdling it is necessary not to stop stirring before the mixture is cold.” Passage marked in red. Photograph: Regionaal Archief Alkmaar. For Eikelenberg, heat was both friend and foe and until his varnishes reached firm, cool ground, they required careful guidance and attention. Cooling down was thus as arduous a process as heating the mixture was in the first place. Yet, once cooled down, true colors are revealed – deprived from heat and stabilized by the cold. Simon Eikelenberg, “Aantekeningen betreffende schilderen,” MS 390, Collectie Aanwinsten, Regionaal Archief Alkmaar, fol. 806. Original: “na mate dat het gloejend wierd, veranderde de menij die naast tegen de zijden van de kroes aan-zat en wierd geel, gelyk ook ’t onderdtste; ‘t welk doe ‘t kout was niet anders dan gele masticot geleek”. Eikelenberg, “Aantekeningen betreffende schilderen,” MS 390, fol. 827. Original: “Doe de vernis koud was bevond ik ze wat dun en datze niet genoeg dekte.” Translation from: A. van Schendel, “Simon Eikelenberg’s Experiments on the Preparation of Varnishes,” Studies in Conservation 3 (1958), 130. Eikelenberg, “Aantekeningen betreffende schilderen,” MS 390, fol. 802. Original: “Doe ‘t wel vermengt was, kleijnsde ik ‘t door een doek en liet het kout worden, wanneer ‘tzelve een dikagtige en geelagtige vernis vertoonde” Translation from: Schendel, “Simon Eikelenberg’s Experiments,” 128. Eikelenberg, “Aantekeningen betreffende schilderen,” MS 390, fol. 824. Original: “Hieruijt kan men afnemen dat om ’t schiften voor te komen, men niet moet op-houden met roeren voordat se kout is.” Translation from: Schendel, “Simon Eikelenberg’s Experiments,” 129. Eikelenberg, “Aantekeningen betreffende schilderen,” MS 390, fol. 827. Original: “gestadig omroerende totdat het gantschelijk koud was.” Translation from: Schendel, “Simon Eikelenberg’s Experiments,” 130. Eikelenberg, “Aantekeningen betreffende schilderen,” MS 390, fol. 832. Original: “tot koutwordens toe geroert te hebben”. 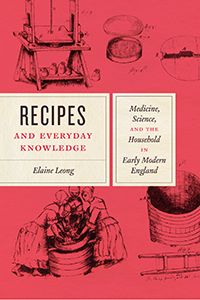 Our very own Elaine Leong’s new book Recipes and Everyday Knowledge Medicine, Science, and the Household in Early Modern England has just come out with the University of Chicago Press. We are super excited to offer you this interview with the author. TRP: Congratulations Elaine on your new book! We have read it with such pleasure. Ina few sentences, could you tell our readers why they should read it too? Sure! My book offers a window into the rich and diverse knowledge practices in early modern English households. Using a range of sources such as recipe books, letters and more, it brings into focus what I term “household science” – that is, quotidian investigations of the natural world – and situates these within broader and current conversations about gender and cultural history, the history of the book and archives and the history of science, medicine and technology. Using a number of case studies, I argue that household science involved a range of activities from conducting structured, multi-stepped recipe trials to gaining in-depth knowledge about the natural and material world. I also show that knowledge-making in the home was deeply framed by a number of concerns, from social obligations to household economies to family strategies. All that said, if you’re interested in 17th century methods for fattening turkeys, pickling samphire, brewing ale or creating a family archive, this is the book for you. TRP: What drew you to researching household medicine? Why is this important? The sources! Very early on in my research career, I spent a few amazing days in the Wellcome Library looking at their manuscript recipe collections and was hooked! I had so many questions during those first few encounters with the manuscripts, many of which became central themes in the book. For example, my initial curiosity about how these books were created and how the know-how contained within was tried and tested were developed into chapters 1 (Making Recipe Books in Early Modern England), 3 (Collecting Recipes Step-by-Step) and 4 (Recipes Trials in the Early Modern Household) in the book. For me, recovering the everyday knowledge practices of the household is crucial as it pushes us to recognize that exploration of the natural world can happen in the humblest circumstances and conducted by a wide range of actors. TRP: Your book contains several beautiful illustrations, including photos from manuscripts. 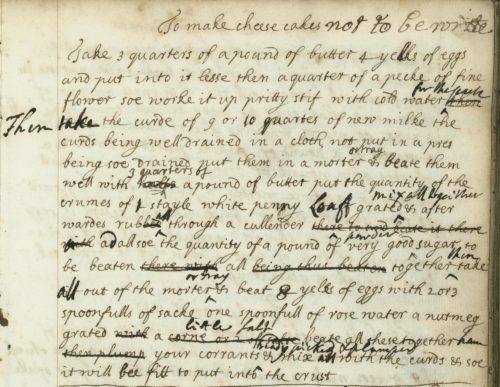 Can you tell us a little about the materiality of recipe writing in the Early Modern England? For sure. As some RP readers might know, I have long been interested in paper use within the household. Working on this project, I was struck by the many ways in which householders used pen and paper to record and communicate knowledge practices. 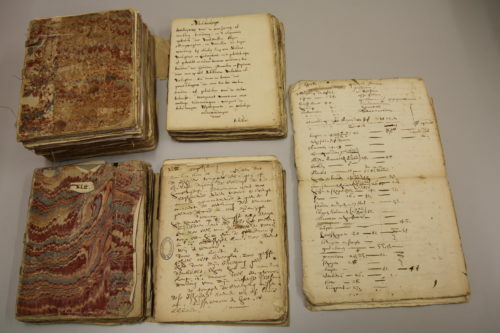 Many used their notebooks from front and back, entering culinary recipes on one side and medical ones on the other. Others used multiple notebooks to separate different kinds of tasks. Within the books themselves, we see householders annotating, writing over and scrawling out recipes. I use these very material practices to tease out the multi-step assessment processes used in recipe trials. The cheesecake recipe in the Godfrey family collection is one of my favorite examples as it shows how the family tried over and over again to test and modify the ingredient proportions and baking instructions, only to declare it “not to be write”, i.e. not to be added to the family’s go-to recipe book. This eagerness to preserve or salvage the recipe, as I termed it, is due to the fact that the know-how was afforded both social and epistemic value. If recipe exchange was a way to strengthen social relationships and build networks, it makes sense that householders thought twice (or three times) before discarding the gifted recipe. Cheese cake recipe in the book of the Godfrey family. Wellcome Library Western MS 2535, p. 5. With kind permission from the Wellcome Collections. TRP: Since we are in the festive season, could you tell us a bit about ‘Bess’ Turkey’,which you discuss in your book? Ha! That is one of my favorite episodes in the book. The dozens of detailed letters between Johanna St. John (see here and here) and her steward Thomas Hardyman were a really lucky find and made writing the chapter about household management super fun. In the end, it was difficult to pick and choose between the numerous examples offered by their epistolary conversations. I settled on talking about raising turkeys, maintaining the Lydiard garden and distilling medicines to display the broad range of natural, material and technical knowledge utilised by householders (masters/mistresses and servants) on a daily basis. The turkey episode was fascinating. 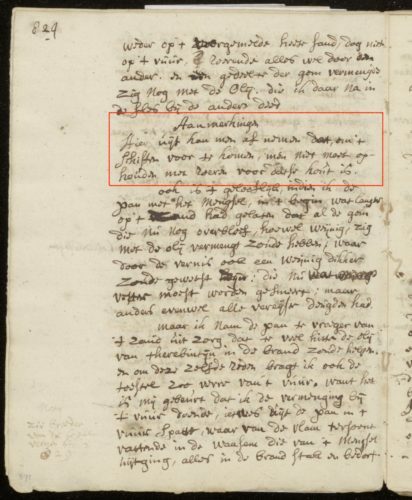 At first, I was a little surprised to discover that turkeys occupied such a central place on early modern tables, and reading deeper into the letters, I found the “turkey letters” (as I call them) to be revealing of contemporary knowledge about animals and the difficulties of managing a household from afar. Basically, in this period, Johanna St. John and her family were residing in Battersea but relied upon their country estate at Lydiard Park near Swindon to produce a myriad of foodstuffs from turkeys to bacon to cheese to venison. A run of letters demonstrates Johanna’s particular concerns about her dairymaid Bess’ skills in rearing turkeys. She continually pleaded for more turkeys to be sent to London and repeatedly complained that the sent turkeys were either not fat enough or past their prime. Wonderfully, Johanna tries a number of strategies to encourage or scare Bess into doing a better job and ends up offering detailed instructions on how to feed turkeys. Initially, this seemed like a lot of fuss about poultry but contemporary menus revealed a food economy where one turkey was transformed into a number of meals. Like 21st century cooks, the St. John household first ate their turkey whole and then feasted on the leftovers like cold meat or turkey hash for many meals afterwards. The final piece of the puzzle came when Johanna confided in Hardyman that she’d love a turkey to give away. It turns out turkey was one of Johanna preferred “little presents” (as Felicity Heal terms them), in the vibrant early modern economy of food gifts and returned favors. Second to Bess’ troubles with fattening turkeys, my other favorite episode in that chapter involves the runaway gardener and bickering over plant cuttings. But you’ll have to read the book to find out more. 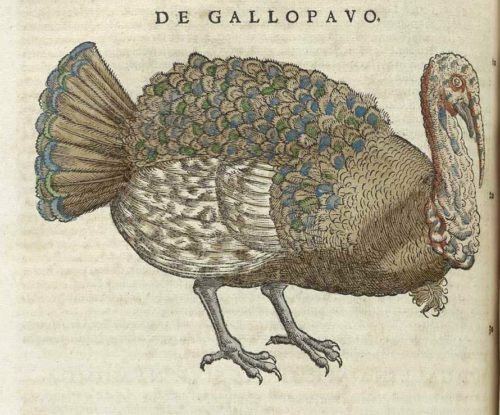 Image of a turkey taken from Conrad Gesner, Historia animalium (Tigvri : Apvd Christ. Froschovervm, anno MDLI[-MDLXXXVII] [1551-1587]). With thanks to the National Library of Medicine. TRP: One aspect of your work that stood out for us was your attention to recovering the experiences and expertise of servants, not just of gentlemen and gentlewomen? How did you go about this? This is a wonderful question. As all our readers know, while manuscript recipe books are rich and fascinating sources, they are mostly created by gentlemen and gentlewomen. Early modern gentry households though, as social historians have shown, were filled to the brim with people, each with a specific role. While the mistress and master of the house have received quite a bit of attention in the past, I was really eager to dig deeper into who did what and into the social relationships and power dynamics between the different actors. With my focus on household science, I was also interested in finding out more about what Steven Shapin has termed “invisible technicians”. As I outlined in the previous question, I was lucky to find the series of letters between Johanna and her steward. Johanna was quite the micro-manager and so it made it possible to understand the various tasks taken on by household servants and the complex web of obligations and expectations held by both parties. 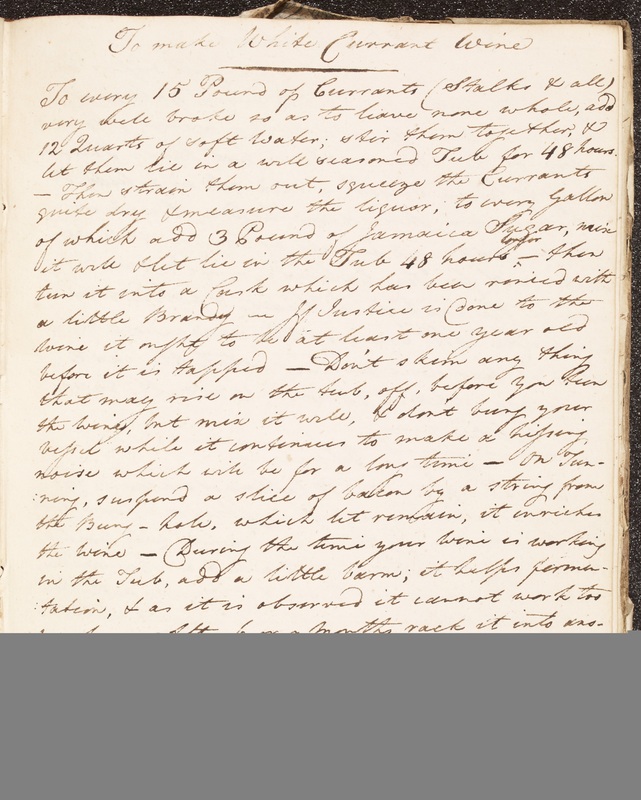 Another series of letters, this time about beer brewing and water boiling, between Edward Conway and his nephew Edward Harley further revealed how Conway viewed the Petworth brewers in incredibly high regard, refusing to conduct recipe trials on their advice. The appearance of dairy maids, gardeners, herb women, cheesemakers, brewers, stewards and more in these letters remind us of the need to view early modern households as collective of knowers and makers and to tease out dynamic relations within these communities. Aside from these two runs of letters, I also scoured handwritten recipe books for hints of servants’ experiences and expertise. As readers of the book will discover, sometimes these were noted in recipe titles, other times it might just be a change of handwriting. I remain committed to recover the knowledge activities of a wide swath of historical actors. I think that there is still a great deal of work to be done here which makes for many fascinating research projects to come (see for instance Leah Astbury’s project). TRP: Could you share with us an anecdote or story about your research? Gosh. This has been such a long project that there are definitely stories, though most are quite nerdy. One thing though sticks in my mind. Years ago, when I worked at the University of Warwick, I sat next to the inestimable Bernard Capp for some seminar or another. In passing, Bernard mentioned to me that he had just read a letter where the writer claimed that he was sent recipes which had originated from the writer’s own collection. I was fascinated and followed-up the generously provided citations. The letter was sent by Viscount Edward Conway to his nephew Sir Edward Harley and one in a series of letters which I now consider one of the most revealing sources about recipe knowledge in early modern England. 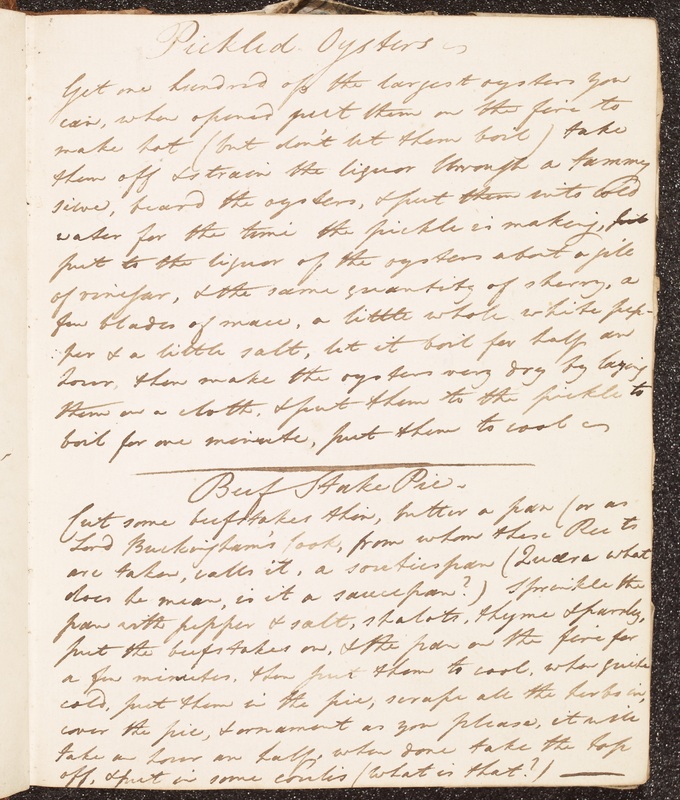 In them, Conway described how he assessed recipes on paper, assigned expertise and detailed how he sent Harley on recipe hunts or to follow-up on his recipe trials. The Conway/Harley letters formed the central case study for my third chapter “Collecting Recipes Step-by-Step” and were crucial in helping me figure out the rich knowledge practices behind the hundreds of recipe books in our archives. I probably would never have found the letters were it not for the chance conversation. In many ways, this anecdote reflects some of the main arguments of the book – that knowing so often comes from the “practices of everyday life”. Recipes and Everyday Knowledge is available and also directly from the University of Chicago Press website where readers can 20% off the list price using the code UCPNEW.